If you’ve been following our Facebook and Twitter feeds for the past few days, you may have noticed that we’ve been talking a lot about Syria. We’ve shared facts about the extent of the Assad regime’s atrocities, the staggering humanitarian crisis that has resulted, the progression of the conflict over the past two years, and the international community’s various efforts to resolve the crisis. Today, we’re taking the next step with the launch of syriasly.org, which will be the online hub for our Syria education and advocacy efforts over the next few months. I encourage you to visit the site and sign the petition addressed to Secretary of State John Kerry, which outlines several specific steps the United States should take to mitigate the effects of mass atrocities in Syria. I also encourage you to spread the word on Facebook and Twitter, and, if you have the ability, to bring the movement to your community by holding an event. In case you didn’t catch on, the campaign name, #Syriasly, is a riff on the word “seriously”…as in, “SERIOUSLY?! ?” Why do we think that’s an appropriate question to ask at this point? Well, you don’t need to be an expert on the situation in Syria to know that every international effort to address it has failed. Two successive United Nations envoys–first Kofi Annan and now Lakhdar Brahimi–have been unable to negotiate a diplomatic solution. Russia and China have blocked attempts by the UN Security Council to impose further sanctions on the Assad regime. Those sanctions that have been imposed by the United States, European Union, and Arab League are being undermined by the the Russian and Iranian governments’ continued financial support of the Assad regime. Syria’s neighbors are struggling to absorb overwhelming inflows of displaced persons, leading to dire conditions in refugee camps and increasing the risk of a regionalized civilian protection crisis. Although donor governments are providing humanitarian aid, it is not nearly enough, and very little is reaching the areas of greatest need within Syria. Of course, no conflict has an easy solution, and U.S. leverage is limited in any mass atrocity situation. But at the minimum, one would think that the reality of 70,000 deaths with no end in sight, coupled with the failure of all preceding efforts to mitigate the situation, would lead to a renewed sense of urgency on the part of U.S. policymakers as the conflict enters its third year. Unfortunately, there are few public indications that this is the case. The Obama administration has been very candid about the steps that it is not willing to take–military intervention and arming opposition forces, both of which do raise very legitimate concerns from a civilian protection perspective–but has not articulated a clear strategy for either ending the current atrocities or ensuring that a post-Assad transition does not entail even more violence and instability. That’s why, starting today, STAND students across the country are joining together to ask: Syriasly? Our petition calls on the administration to help improve conditions for Syrian refugees by dramatically increasing humanitarian assistance, be proactive about ensuring that a post-Assad transitional government is committed to the rule of law and the inclusion of women and minorities, and provide direct assistance to Syrian civil society. Beyond these specific asks, however, we’re sending a broader message to our leaders that inertia is not an option. Through this petition, through the events that you hold in your community, and through future actions (including an national call-in event on March 15, the second anniversary of the beginning of the conflict), we will continue to call attention to the ongoing atrocities in Syria, and demand that civilian protection remain a top priority for this administration, until a solution is found. Since STAND’s founding in 2004, students have rallied around a simple but profound motto: “Don’t stand by, STAND up!” There is no more appropriate response to the current situation in Syria. 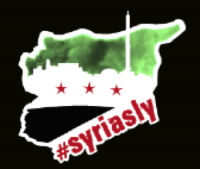 Visit www.syriasly.org today and join us. This entry was posted in Conflicts, Syria and tagged #syriasly. Bookmark the permalink.